An Illinois city is hoping that by making solar more affordable for its residents it can help meet its own goals of reducing greenhouse gases. The key? 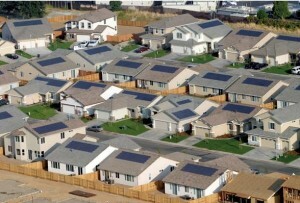 A solar group-purchase program that officially kicked off this December. The Midwest Renewable Energy Association (MREA) has already run a successful solar group buy throughout Milwaukee, one that encouraged 98 homeowners and business owners to install solar panels largely through the enticement of lower prices that come with volume buying. This entry was posted in Financing, Nebraska / Midwest News, NewsBlog and tagged Dan Rafter, Midwest Energy News, Midwest solar energy development models, reducing greenhouse gas emissions, solar group purchasing on January 6, 2016 by Helen Deffenbacher.